Archie Bell & the Drells ist eine USamerikanische R&S- Vocal Gruppe, die 1965 in Texas Houston gegründet wurde und bis in die 1970er Jahre hinein existierte. Die 4 Mitglieder sind Archie Bell, Lee Bell, James Wise und Willie Pernell. Nach dem Flop mit ihrer 1. Plattenfirma kam es 1968 mit Tighten Up bei Atlantic Records zum Riesenerfolg. Hi everybody. 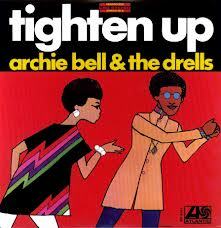 I’m Archie Bell of the Drells from Houston, Texas. We don’t only sing, but we dance just as good as we walk. First tighten up on the drums. Come on now, drummer. I want you to tighten it up for me now. Oh, yeah. Tighten up on that bass now, tighten it up. Ha, ha, yeah. Now let that guitar fall in. Oh, yeah. Tighten up on the organ now. Yeah, you do the tighten up. Yeah, now, I said, if you can do it now. It sure would be tough. Now look here, come on now. Now make it mellow. Let’s tighten it up now. Do the tighten up. Everybody can do it now. So get to it. We’re gonna tighten up. Let’s do the tighten up. You can do it now. So baby, get to it. Look to your left now. Look to your right. Everybody can do it. But don’t you get too tight. Come on and tighten up. Let’s tighten it up now. Let’s tighten it up now. Tighten it up. Do the tighten up. Come and tighten it up. Tighten it up now. Come on now, Billy. Tighten it up. Oh, yeah. Sock it to me now. Tighten it up. Come on and tighten up that bass. Oh, yeah. Now tighten it up, organ. Yeah. Now everybody tighten it up now. Now look here. We gonna make it mellow for you now. We gonna make it mellow now.